Abstract: Internet telephony is a service that has become popular in recent months. The ability to make long distance calls for a low rate or free on the internet is an incredible convenience for many. Internet telephony is an intriguing service that has become popular in recent months. After all, the ability to make long distance calls for a low rate (sometimes free) on the internet is an incredible convenience for many computer users. The ability to make business or casual calls on the internet can save users a lot of money. In an attempt to make internet telephony easier for potential callers, Actiontec has come up with a new product called the Actiontec USB Internet Phone Wizard. In a nutshell the Internet Phone Wizard is supposed to allow you to plug in your telephone into the hub like device, and make internet calls straight from your telephone. The IPW requires a Internet Telephony Service Provider such as www.dialpad.com (we will be using this as the test ITSP.) An ITSP provides the user with the ability to make calls to other people in serviced regions. Dialpad only provides free service to numbers in the United States of America. One IBM compatible computer with a USB port, 16MB RAM, and a CD-ROM drive. Microsoft Windows 98, 98 SE, and 2000. Analog telephone and or analog telephone line. LAN or modem-based Internet connection. Intel PIII-933, 256MB PC-133 RAM, Rogers@home internet service. There is a two part installation procedure, first of all you have to install the Internet Phone Wizard. 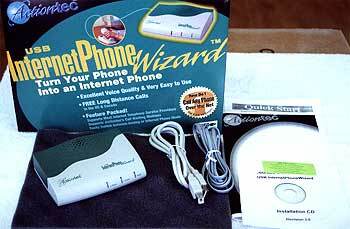 Installing the Internet Phone Wizard is a breeze. First you plug the USB cable into the IPW, then you plug the USB cable into a free USB port on the back of your computer. If you don't have any free USB ports, then you will have to either disconnect a USB device, or buy a USB hub. The device is powered via the USB port, this has to be considered a huge convenience. I am sick and tired of plugging in ac adapters behind my desk, it's a battle going on back there! Windows 98 will detect the new device the moment you plug the device in. At this point in time, you will have to insert the installation CD. After installing the drivers, you will have to get into the Windows desktop, and then go to CD-ROM drive (through My Computer or Windows Explorer), and install the Actiontec USB Internet Phone Wizard software. Next you should connect your telephone cable into the telephone-in port on the IPW, then plug in the supplied telephone cord into the telephone-out port on the IPW into your telephone.